‘School readiness’ – what does it mean? ‘School readiness’ – what does it mean? Common questions we are asked – How will you get my child ready for school? How will they cope in a classroom when you play all day? Can you teach them colours and to write their name? Are they ready for school? The truth is – we don’t get children ‘ready’ for school. We won’t interrupt their play to sit them at a table and trace over letters or play matching games to teach them numbers. We don’t follow themes or plan activities relating to topics, we listen to the children’s interests and adapt our daily provision to ensure the children remain engaged. We would never make them sit on the carpet for long periods of time to be ‘taught’ – under 5’s are just not built to do that! We provide an environment that is age appropriate with a team of highly trained key people to encourage and challenge your child every step of the way! Children are born curious and eager to learn, given the right environment and the right adults, children will naturally make progress. So, do our staff kick back and watch the children play? No! We will encourage your children to get involved, have a ‘can do’ attitude and praise them when they do well, all important for a child to develop a healthy attitude to learning. Our play changes every day, doctors and nurses one minute to discussing the lifecycle of a chick and then seeing which object will sink or float the fastest. 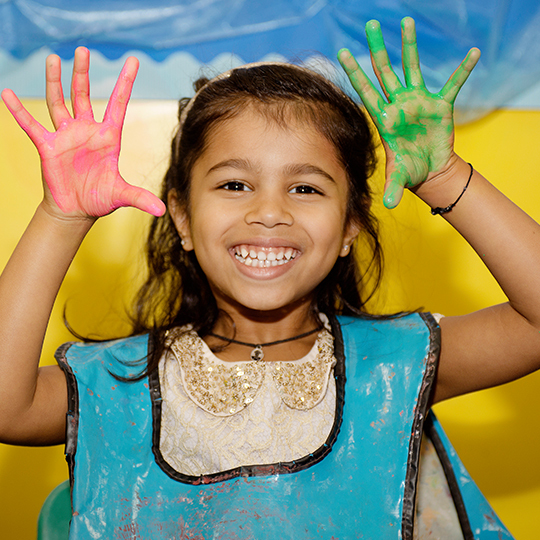 At Boys & Girls Nursery, children are given freedom to follow their own lines of enquiry and their own interests. What looks like ‘just playing’ to some, is in fact serious business to us. By allowing the children to follow their own interests and giving them time, they begin to make progress you could only dream of from a ‘planned’ activity. Does it work? Absolutely! With staff on hand to gently encourage, prompt, suggest, model, praise and support – children begin to show an interest in all of the things ‘school’ requires of them. Take writing as just one example. If you pull a child away from their play to come and do ‘writing’ with you, it is highly likely they will not be interested. Go and join their play, follow THEIR interests and you might just find that the perfect opportunity arises to introduce a clipboard and pencil! And if they aren’t interested? Then they just aren’t ready yet – and that’s absolutely fine by us!